The Agriculture Department announced the September Federal order Class III benchmark milk price at $16.36 per hundredweight (cwt. ), down 21 cents from August, 3 cents below September 2016, but $1.48 above California's comparable 4b cheese milk price. That's the largest shortfall since March when it hit $2.05. The Class III price is equivalent to $1.41 per gallon, down a penny from August. The nine month Class III average is at $16.12, up from $14.38 a year ago and $16.04 in 2015. Class III futures late Friday morning portended an October Class III price at $16.80; November at $16.57; and December at $16.35 per cwt. The September Class IV price is $15.86, down 75 cents from August but $1.61 above a year ago, and the lowest Class IV since May 2017. Its nine month average is at $15.51, up from $13.65 a year ago and $13.70 in 2015. California's comparable September Class 4b cheese milk price is $14.88, down $1.38 from August and 36 cents below a year ago. It is the lowest 4b price since April 2017 and the lowest September 4b in five years. The year's average now stands at $15.24, up from $13.64 a year ago and $14.62 in 2015. The September 4a butter-powder price is $15.69, down 99 cents from August, but is $2.11 above a year ago. Its nine month average is at $15.32, up from $13.26 a year ago and $13.60 in 2015. The October 4 Daily Dairy Report reminds us of the differences in how California and Federal order Class milk prices are determined. It says "The California 4b price is derived from the simple average of the CME Cheddar block price from the 26th of the preceding month though the 25th of the current month." "The Federal Order Class III price is calculated from the monthly weighted average National Dairy Products Sales Report Cheddar price, which includes both block and barrel cheese prices." Meanwhile, the October 3 Global Dairy Trade (GDT) auction shifted gears as a weighty 83.75 million pounds of product found its way to the GDT, up from 75.2 million pounds September 19, 73.9 million September 5, and 71.1 million on August 15. The weighted average for products offered was down 2.4 percent, following a 0.9 percent increase last time and a 0.3 percent increase September 5. GDT Cheddar cheese was up 1.9 percent, following a 1.9 percent drop last time, and rennet casein inched 0.9 percent higher, after fell 2.4 percent in the last event. Buttermilk powder led the declines, down 10.3 percent. It did not trade last time. Butter was down a bearish 3.6 percent and anhydrous milkfat was down 3.4 percent, following increases last time of 1.2 and 5.3 percent. Whole milk powder was down 2.7 percent, after it inched 0.6 percent higher, and skim milk powder was off 1.4 percent, after it slipped 1.2 percent last time. FC Stone equated the GDT 80 percent butterfat butter price to $2.5833 per pound U.S. CME butter closed Friday morning at $2.34. GDT Cheddar cheese equated to $1.8640 per pound U.S. and compares to Friday's CME block Cheddar at $1.76. GDT skim milk powder averaged 85.94 cents per pound and whole milk powder averaged $1.3778. CME nonfat dry milk closed Friday at 82 1/2-cents per pound. There was a rumor over the fact that GDT whole milk powder fell 2.7 percent on average, when it had gained 3-4 percent the previous week on the New Zealand Futures Exchange. Speculation was that some Chinese buyers were unable to connect to or had trouble maintaining a steady connection to the GDT. FC Stone's Dave Kurzawski dispelled that in the October 9 Dairy Radio Now broadcast, stating that safeguards are in place to prevent that and that the fall occurred "because buyers, for whatever reason slowed down a bit." He added that the GDT's message for the CME was that "demand is good but not stellar." August milk production totaled 18.1 billion pounds, up 2.0 percent from August 2016 and USDA's latest Dairy Products report shows where that milk went. August cheese output totaled 1.03 billion pounds, down 0.7 percent from July but 2.3 percent above August 2016. Year to date (YTD) output stands at 8.2 billion pounds, up 2.5 percent 2016. California produced 208.9 million pounds of that cheese, down 2 percent from July but 1.6 percent above a year ago. Wisconsin, at 272.3 million pounds, was off 0.8 percent from July but 1.5 percent above a year ago. Idaho dropped to 72 million pounds, down 3.5 percent from July and 8 percent below a year ago. Minnesota was down 2.2 percent from July but 11.4 percent above a year ago. New York was up 13.7 percent from July and 6.3 percent above a year ago. Italian cheese totaled 436 million pounds, down 3.5 percent from July but 2.5 percent above a year ago, with YTD output at 3.6 billion pounds, up 1.5 percent. Mozzarella, at 335.8 million pounds, was up 2.3 percent, with YTD at 2.8 billion pounds, up 1.0 percent. Total American type output fell to 398.6 million pounds, down 0.5 percent from July but 1.5 percent above a year ago. YTD totaled 3.26 billion, up 3.3 percent. Cheddar output, the kind of cheese that is traded at the CME, totaled 284.7 million pounds, down 0.1 percent from July, but 1.2 percent above a year ago. YTD is at 2.39 billion pounds, was up 4.6 percent. U.S. producers churned 131.2 million pounds of butter, down 3.4 percent from July but an impressive 6.2 percent above a year ago. YTD butter totaled 1.25 billion pounds, down 0.7 percent. California produced 38.7 million pounds of that butter, up 1.3 percent from July and 1.2 percent above a year ago. New York output was down 8.8 percent from July and 21 percent below a year ago. Pennsylvania was down 42.1 percent from July but 0.9 percent above a year ago. Yogurt output amounted to 388.1 million pounds, down 2.8 percent from a year ago, with YTD at 2.98 billion pounds, down 1.1 percent. Dry whey totaled 95.8 million pounds, up 24.5 percent, with YTD hitting 698.9 million pounds, up 8.5 percent. Dry whey stocks were up 2.1 percent from July and 68.6 percent from a year ago. Nonfat dry milk production totaled 136.4 million pounds, down 7.9 percent from July but 15.9 percent above a year ago, with YTD at 1.24 billion, up 3.1 percent. Skim milk powder production totaled 45.6 million pounds, down 13.6 percent from July and 1.8 percent below a year ago. YTD output is at 386.6 million pounds, was up 2.5 percent. The report also showed August nonfat dry milk stocks at 307.8 million pounds, up 11.9 million pounds or 4 percent from July and 72.9 million pounds or 31 percent above a year ago. U.S. dairy product prices at the Chicago Mercantile Exchange were mixed the first week of October as traders weighed the week's GDT and August Dairy Products report. The 40-pound Cheddar blocks closed Friday at $1.76 per pound, up 2 1/2-cents on the week, 21 cents above a year ago, and the highest block price since August 1, 2017. The 500-pound Cheddar barrels finished at $1.7450, up 5 1/4-cents, 23 1/2-cents above a year ago, and the highest since August 21. Only 3 cars of block traded hands on the week at the CME and 6 of barrel. Dairy Market News reports that milk is becoming less available in the Central region. Cheese production varies but contacts view the market tone as "steady." The western cheese market is relatively strong as domestic demand remains solid. Export sales are also stronger as the result of favorable cheese prices and exchange rates. Some contacts don't expect prices to increase much because many people have already bought the stocks they need. August cheese exports were "slightly weaker than expected," according to FC Stone, "but overall a strong number and up significantly from last year. Same story for butter. NFDM/SMP exports were a little weaker than expected, but that has been true nearly every month this year." Spot butter climbed to $2.3750 per pound Thursday but it closed Friday at $2.34, still up 2 1/2-cents on the week and an eye grabbing 83 cents above a year ago when it fell to $1.85 per pound. The week saw 43 cars finding new homes. Cream into Central churns remains available, according to DMN, and butter output is matching cream availability. Retailers continue holiday orders. Contacts suggest many manufacturers are not producing the 82 percent butterfat European style butter, so global interest is up, but only with specific U.S. manufacturers. Western butter makers report steady production amid strong domestic demand and interest from international buyers. Although cream is relatively tight for this time of year, butter makers are not concerned as there are adequate amounts of cream and a number have enough butter for much of their Fourth Quarter needs. HighGround Dairy (HGD) reported in its October 2 "Monday Morning Huddle" that "Exhaustion finally set in for European butter prices with the first pullback recorded since early February 2017 last week as milk deliveries are stronger than the prior year into autumn due to higher milk prices." "There has reportedly been a transfer in demand from block butter to mixed fats, indicating that last week's record high prices (Dutch butter: $3.7853 per pound) officially discouraged buyers has led to substitution (vegetable and otherwise). With inventories in the US ample, a weaker indication from Europe added pressure to the market with U.S. prices dropping," says HGD. Cash Grade A nonfat dry milk saw a Friday close at 82 1/2-cents per pound, a quarter-cent lower on the week and 9 cents below a year ago, with 33 cars sold on the week at the CME. FC Stone's October 5 Early Morning Update states that "New Zealand weather concerns seem to be the only 'bullish' news in terms of nonfat dry milk. That said, there is a bit of time before now and the end of the NZ season. For now, this is something that one should keep an eye on." U.S. dairy margins have been mixed since the middle of the month, improving in nearby periods while weakening in deferred 2018 slots, according to the latest Margin Watch (MW) from Chicago-based Commodity & Ingredient Hedging LLC. "Margins remain above average from a historical perspective through Third Quarter 2018, even though they have been slipping recently," the MW stated. "A slight recovery in milk prices following a steep decline since mid-August allowed nearby margins to improve recently, as feed costs have held relatively steady." It adds that "USDA's Quarterly Grain Stocks report pegged final old-crop corn ending stocks of 2.295 billion bushels and soybean stocks at 301 million bushels. While both figures were below industry expectations, the market remains under pressure from advancing harvest progress." USDA's latest National Milk Cost of Production report shows August total milk production costs were down from July and a year ago. Total feed costs averaged $10.50 per cwt., up 7 cents from June but 22 cents below the revised July figure and 27 cents below August 2016. Purchased feed costs, at $5.75 per cwt., were up 16 cents from June, a penny below the revised July average, and 37 cents below August 2016. Total costs, including feed, bedding, marketing, fuel, hired labor, taxes, etc., at $22.39 per cwt., were up 44 cents from June, 4 cents below July, and 7 cents below a year ago. Feed costs made up 46.9 percent of total costs in August, down from 47.8 percent in July and down from 47.95 percent a year ago. FC Stone reports that harvest progress was at 17 percent for corn, up from the previous week but below last year's 23 percent and the 5 year average of 26 percent. "Big crops take longer to harvest," says Stone. "Soybeans were farther along posting 22 percent harvested as of October 1, slightly below last year's 24 percent and the 5 year average of 26 percent." Cooperatives Working Together only had one request for export assistance this week from a member to sell 220,462 pounds of butter to customers in the North Africa. The product has been contracted for delivery through December. 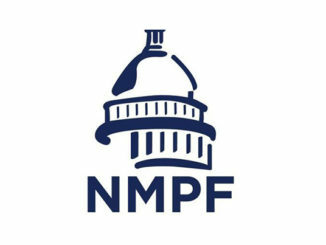 In politics; dozens of dairy farm organizations, led by the National Milk Producers Federation (NMPF), are jointly supporting new congressional legislation that it says "would help address one of the most challenging issues affecting America's milk producers: obtaining a dependable, legal workforce." 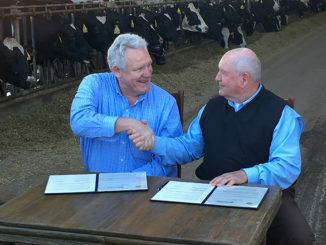 A founding member of the Agriculture Workforce Coalition, NMPF was joined by 57 dairy cooperatives and state dairy farmer associations in a letter backing Rep. Robert Goodlatte's (R-VA) new Agriculture Guestworker (AG) Act. The bill would "establish an entirely new visa program, dubbed the H-2C visa, which would allow farm employers to bring in foreign workers on a year-round basis. It would replace the existing H-2A temporary visa program, which dairy farmers cannot use because their labor needs are year-round, not seasonal." In its trade discussions with Japan and Mexico, the EU is currently pushing approval for lists of geographical indications that include many common food names in an effort to monopolize those terms and block market access for various foods, wines and other beverages, the groups note."